The Home screen is the first thing you’ll see after you turn on your tablet, and it’s where you’ll go when you close an app. It holds folders full of apps, is where one or more web browsers lives, and is the launching pad for the NOOK eReader (and other reading apps). 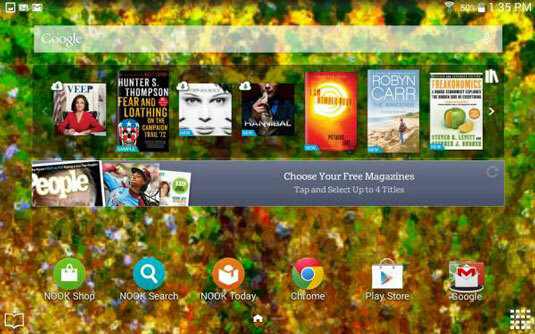 The main Home screen for the Galaxy Tab 4 NOOK is shown here. Everyone’s Home screen starts out looking the same, but you have an almost infinite number of ways to customize it. The first thing many users do on any tablet, smartphone, or computer is put their own wallpaper behind the home screen. They do this because it makes them feel at home. The wallpaper you see here is a stylized version of a photograph of a field of sunflowers near Seville, Spain. On the Home screen, press and hold on any unoccupied section (not on an icon, for example). Assign a wallpaper for the Home screen, the Lock screen, or both. Then tell the system where the image is. On the Home screen, swipe down from the top to display the Settings (gear) icon. Tap the Device tab. In the left panel, tap Wallpaper and follow the instructions. Your Tab 4 NOOK comes with a set of abstract color wallpapers, and you can download free or paid wallpapers from the Play Store and the NOOK Shop. Any image viewable in the Gallery can be used as wallpaper. You can add another, secondary, Home screen by pressing and holding on any Home screen. When the menu appears, choose Page. Scroll left or right to see more Home screens.